Around 20 kilometres further south past Khlong Lan village, Route 1117 ends at Mae Wong National Park -- not to be confused with Mae Wang National Park in Chiang Mai province. Browse places to stay in Kamphaeng Phet on Booking.com. Book Now - Pay Only When You Stay. A remote 894 square kilometres of pristine forest that stretches all the way south into Nakhon Sawan province and west to Tak’s Umphang district, Mae Wong is worth the effort if you want to get way out into the wilderness. While the park includes several waterfalls, the best require a two-night, three-day trek to reach. If you can manage that, the falls at Mae Gee crash over a 200 metre cliff, making it one of Thailand’s tallest. Not quite as dramatic, Mae Rewa Waterfall flows over a sloped rock face into a wide pool that’s great for swimming. 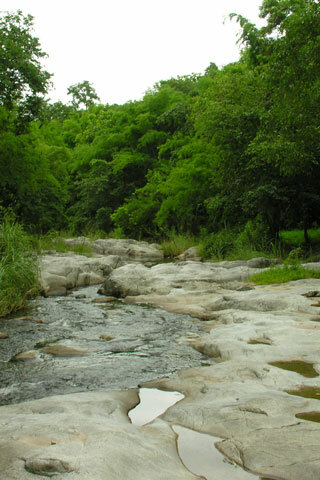 Smaller falls and rapids can be found several kilometres down a narrow, partially paved road that runs through a valley rimmed on either side by old-growth jungle. We believe that this road was once intended to continue all the way to Umphang, an isolated district in Thailand’s far western frontier, but the plan was scrapped when environmentalists resisted in the 1990s. Rumour is that it’s possible to undertake a seven-day trek along the planned route of this road, ending up in Umphang town. Bring a Thai speaker and chat up the rangers if you’re interested. Also within the park’s boundaries is the formidable Khao Mokoju mountain, which soars to 1,964 metres and requires a five-day trek to the summit. A more manageable viewpoint is Chong Yen, reputed to be an outstanding sunset perch located 28 kilometres from park headquarters along the only road. On the way you might spot a wild jackal, porcupine, exotic bird (the park has around 450 avian species), orchids and rare flowers that grow in the high altitudes. A campground, basic accommodation, restaurant and small hot spring pool are available near park headquarters, where a helicopter landing pad draws attention to just how remote Mae Wong is. If visiting by car or motorbike, you’ll need to fill out a form at headquarters before heading further into the park. Though maps and brochures are only provided in Thai, rangers at the visitor centre can speak limited English and it’s possible to arrange guided treks. Tents can be rented for 200 baht while the bungalows start at 1,500 baht and can sleep five or more people. Last updated on 9th June, 2016. There is no public transport to the park. If heading to Khlong Lan Waterfall with your own wheels, simply follow the signs further south along Route 1117 to Mae Wong National Park. The road ends at the park's front gates, from where it's another 9 km to the visitor centre. Admission is 200 baht for foreigners. See below for more sights and activities in Kamphaeng Phet that are listed on Travelfish.org.